What a night! 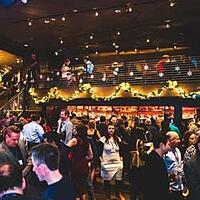 There was shopping, networking, wine tasting, celebrating and prize-winning. The office is still abuzz with talk of the party. A huge thank you to all of the BizX members, friends, family and colleagues that came out to celebrate the holidays with us! #BizXCheer abound! 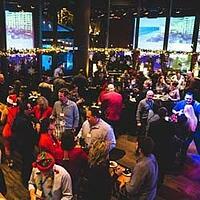 We had over 350 BizX members come out to celebrate the BizX community on December 6th! 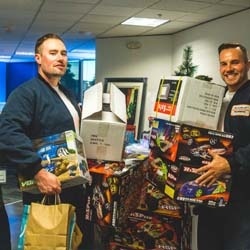 Members spent over 200k shopping at various vendors in the BizX office followed by the kind of party BizX members have come to expect–great food, better company, drinks and dancing! This event was made possible by amazing BizX members. Here’s who made this whole party possible. Be sure to look them up the next time you’re planning an event! Event Experience did an incredible job planning and coordinating the event. We had N33D Creative onsite capturing taking pictures and videos. Check them out on Facebook and stay tuned for a video recap! A big shout out to Bake’s Place for making the party downstairs a real hit! The drinks, the food and the venue were all on point. Did you see our incredible ice sculpture?! Set your next party apart from the rest with a creation of your own from Creative Ice. Dubreezy Entertainment kept the party bouncing and the dance floor packed down at Bake’s Place. If you need a DJ at your next event, give them a call! Valet parking takes your event to the next level. Give Red Carpet Valet a call for your next event. They do a great job for us every year. Freshmade Media put together the promo video that was playing all throughout the office. All of the tables, linens and tent were rented from Grand Event Rentals. Make sure you give them a call for your next event. Suite Restaurant / Lounge brought the delicious appetizers for the shopping portion of the evening. All of the signage for the evening was done by Washington Graphics. Did you get a chance to play with the light board? National Event Pros brought that. They are a must for event entertainment. And how about those vendors? Check out all the members who came and setup shop in our office for the afternoon! It wouldn’t be a true BizX event without wine tasting. A huge thanks to Precept Brands, Northwest Cellars and Eternal Wines for coming out! If you need wine, you need to check them out. Seattle Sun Tan was selling Maui Jim Sun Glasses and Chihuly artwork. There was lots of hair and beauty products thanks to 1630 Hair Artisans. Zoka Coffee was in the house selling coffee and handing out tastings. Gud Craft brought lots of great holiday gifts. If you missed them at the party be sure and check them out on the Marketplace! Independent Pet Supply was on scene selling pet products and food for the furry friend in your life. If you haven’t tried Bite Me Cookies, then you are missing out! They were on hand selling cookies and shortbreads. Bath Fitter came out with a display of bathroom tiles. Did you see all of the beautiful jewelry Dynamic Design Jewelry brought? If not, be sure and check them out on the Marketplace. Heartbeet Organic Superfoods Café came out with their smoothies and pies! High end clothing rental service, Armoire, was on hand with a rack of clothing selling memberships! There was gelato, coffee and other delicious snacks from Vovito. Definitely another must try! Design 10301 was in the house selling clothing, hand bags and scarves. Gunnar Nordstrom Fine Arts came out and had numerous pieces of art for sale. 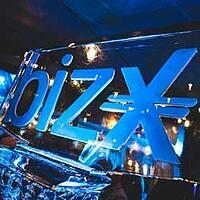 A huge thank you to all of the BizX members that made this party a smashing success! Remember, before you spend cash for the holidays, make sure you think BizX! Download the gift guide and shop through the Marketplace for all your holiday gifting needs! Whether you missed it or lived it, check out the party pictures on Facebook for BizX’s 2017 Holiday Party in Washington.